* Commissioned 2nd Lieutenant, December 11th 1942. * Promoted to 1st Lieutenant, December 1st 1943. 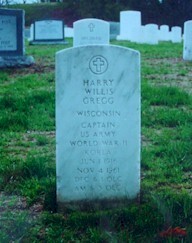 My grandfather, Harry Gregg, was a bombardier in the 389th Bomb Group from June 25, 1943 until January 14, 1944. This site is dedicated to my grandfather, and the veterans of the 389th BG during WWII. During his time with the 389th, my grandfather flew 25 combat missions, which ranged in extremes from flights at 25,000' with temperatures at -60 degrees (F) to a flight over a burning oil refinery at 200' on a hot summer afternoon. This site is meant to help preserve the history of this group of men, and their experiences from 56+ years ago. Thursday, September 09, 1943 Hethel 807 U- Spurrier St. Omer, France Airfield Aborted due to leak in O2 regulator. No sortie credit. Tuesday, September 21, 1943 Tunisia 807 U- Spurrier Bastia/Leghorn, Corsica Port 807 U- suffered flak damage in the nose and an engine. Friday, September 24, 1943 Tunisia 807 U- Spurrier Pisa, Italy Airfield Aborted due to oil leak in #4 engine. No sortie credit. Saturday, September 25, 1943 Tunisia 807 U- Spurrier Pisa, Italy Airfield Aborted due to oil leak in #4 engine. No sortie credit. Friday, October 01, 1943 Tunisia 733 V- Spurrier Wiener-Neustadt, Austria Aircraft Factory Two flak holes in the wings. Wednesday, December 01, 1943 Hethel 807 U- Spurrier Solingen, Germany Industrial 807 U- received one flak hole. Sunday, December 05, 1943 Hethel 807 U- Spurrier Cognac/St. Nazaire, France Port 10/10 cloud undercast. 807 U- returns to base with bombs. Saturday, December 11, 1943 Hethel 807 U- Spurrier Emden, Germany Industrial Heavy flak! 807 U- has 40-50 flak holes. Tail gunner Neff wounded. Wednesday, January 05, 1944 Hethel 807 U- Spurrier Kiel, Germany Port Capt. Spurrier's 25th mission. Friday, January 14, 1944 Hethel 833 Y- Selvidge Pas de Calais, France NO BALL H. Gregg flies as an observer on his 25th mission.